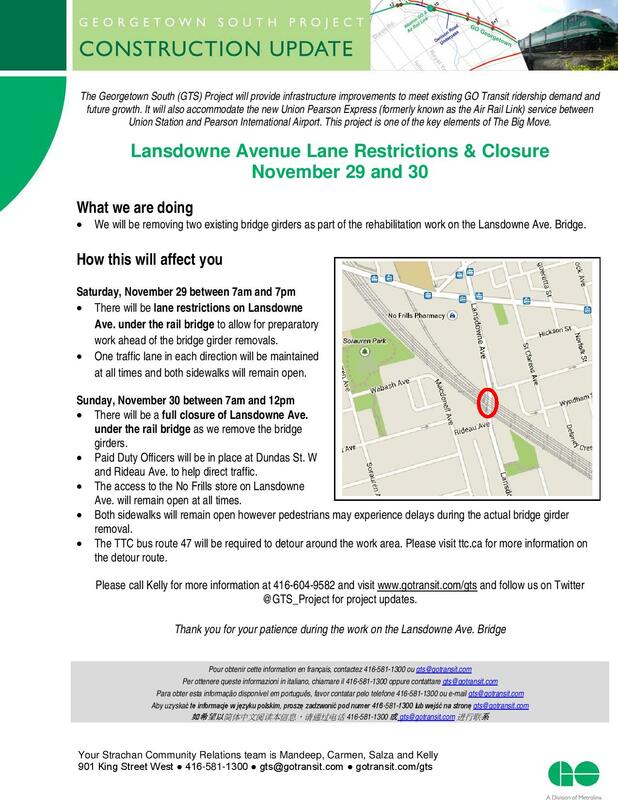 Please be advised of the following Lansdowne Avenue lane restrictions and temporary closure this weekend as GO Transit works to remove two bridge girders. · There will be lane restrictions on Lansdowne Ave. under the rail bridge to allow for preparatory work ahead of the bridge girder removals. · One traffic lane in each direction will be maintained at all times and both sidewalks will remain open. · There will be a full closure of Lansdowne Ave. under the rail bridge as we remove the bridge girders. · Paid Duty Officers will be in place at Dundas St. W and Rideau Ave. to help direct traffic. · The access to the No Frills store on Lansdowne Ave. will remain open at all times. · Both sidewalks will remain open however pedestrians may experience delays during the actual bridge girder removal. · The TTC bus route 47 will be required to detour around the work area. Please visit ttc.ca for more information on the detour route. Please call Kelly for more information at 416-604-9582 and visit gotransit.com/gts and follow Go Transit on Twitter @GTS_Project for project updates. The City of Toronto has determined a preferred route for extending the West Toronto Railpath from Dundas Street West, along the Kitchener GO rail corridor, to beyond Strachan Avenue and the planned Fort York Pedestrian and Cycle bridge. 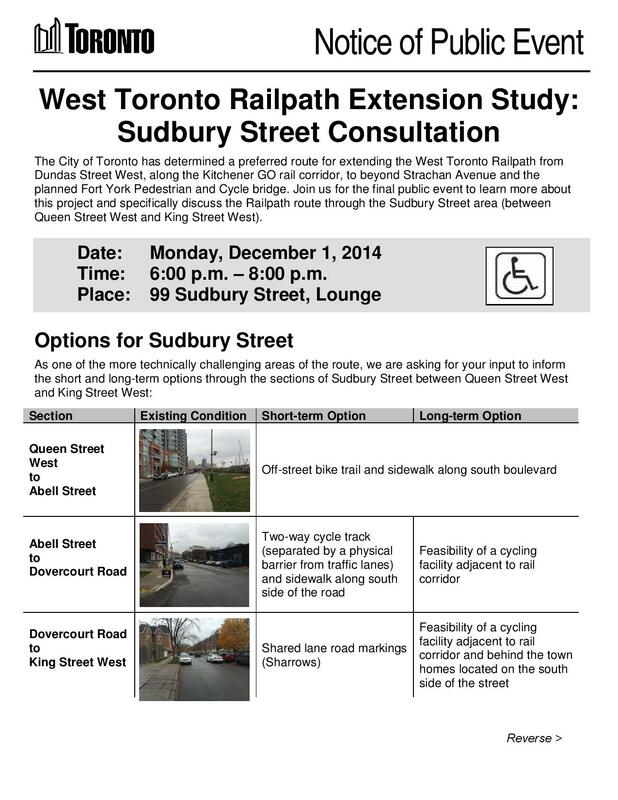 Join us for the final public event to learn more about this project and specifically discuss the Railpath route through the Sudbury Street area (between Queen Street West and King Street West). This is definitely one of the more challenging areas of the route. While this is not in Ward 14, you are still invited to attend this final public event this coming Monday December 1 from 6 to 8 p.m. at 99 Sudbury Street. Thank you to all community members that came to the community consultation to review the preliminary artwork of Elicser, Kwest, Oliver Pauk, and Paul Aloisi. If you missed Monday night’s consultation with the four finalists you can view their proposals online and send in your feedback starting today. Kindly share the link with your contacts – the artists are looking forward to receiving comments as they work towards their final proposals. Today The Globe & Mail published Opinion Editorial I wrote regarding Uber. 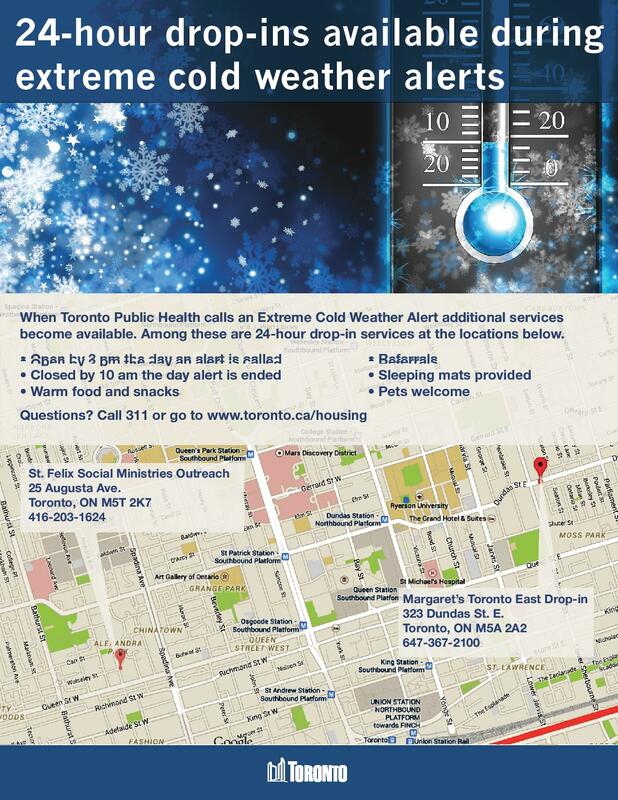 With the start of the cold weather, Shelter, Support and Housing Administration would like to remind you that additional services for people who are homeless are triggered when an Extreme Cold Weather Alert is issued by Toronto Public Health. New this year are two 24-hour drop-ins which will be opened by 3 pm the day an alert is called: Margaret’s Toronto East Drop-In at 323 Dundas Street East and St. Felix Centre at 25 Augusta Avenue. Services include warm food and drinks and referrals to shelter. Both services are pet-friendly. 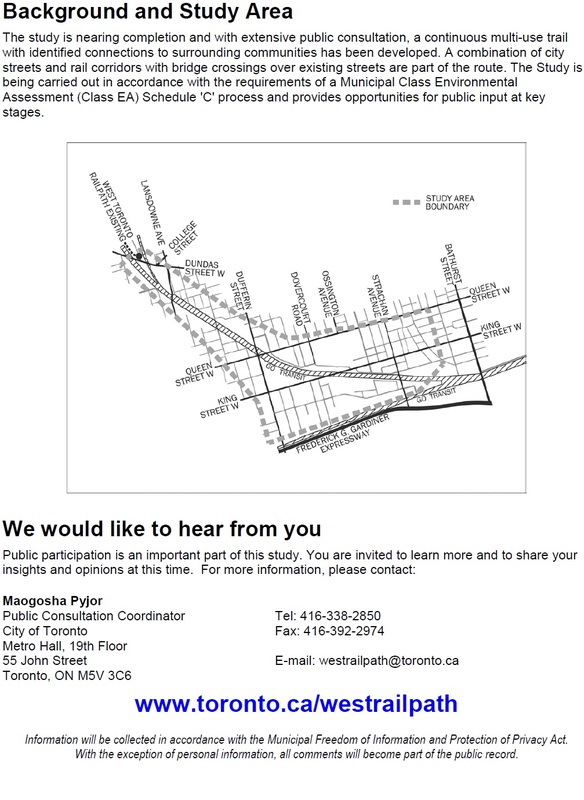 Join us to specifically discuss the Railpath route through the Sudbury Street area (between Queen Street West and King Street West). The City of Toronto is conducting a review of its bylaws that govern outdoor cafés operating on the public right-of-way/sidewalks. The goal is to harmonize existing bylaws and create a single bylaw for all of Toronto, as well as to review fees and establish updated outdoor café guidelines that will help create/maintain safe, comfortable and universally accessible cafés and sidewalks. A draft outdoor café bylaw and draft guidelines have been developed with the help of input from meetings and surveys conducted with stakeholders earlier this year. The stakeholders included business improvement areas/BIAs, the Ontario Restaurant Hotel and Motel Association, resident associations, boulevard café and marketing permit holders, and the general public. Thursday, November 27 from 6 to 9 p.m., Metro Hall, Room 308/309, 55 John St.
Tuesday, December 2 from 6 to 9 p.m., East York Civic Centre, council chamber, 850 Coxwell Ave.
Monday, December 1 from 9:30 a.m. to noon, Montgomery Pool and Health Club, 44 Montgomery Rd. Tuesday, December 2 from 1 to 3:30 p.m., rotunda, Scarborough Civic Centre, 150 Borough Dr.
Monday, December 8 from 1 to 3:30 p.m., North York Civic Centre, ground floor, 5100 Yonge St.
More information, including the possible addition of more pop-up events, and a mechanism for input/feedback are available at http://www.toronto.ca/haveyoursay. A report recommending a consolidated outdoor café bylaw and accompanying guidelines is expected to be submitted to the Licensing and Standards Committee in the first half of 2015. View the presentation delivered on November 20, 2014 on accessibility issues related to Boulevard cafes and marketing.